I’m back with another Sunshine Blogger Award. Shout out to Kelly at Why We Play Games for nominating me for this award! Kelly blogs about gaming reviews on her site as well as exploring why we play games. Check out her post here and take some time to browse her other posts. Also, I’m only nominating 5 blogs this go around. 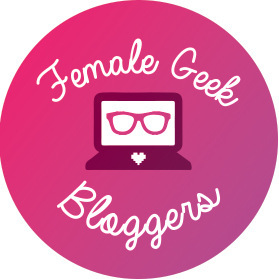 A Geeky Gal has been nominated three more times for the Sunshine Blogger Award, and I’d like to share the love. What is the game that you play the most? Skyrim. I’m constantly going back to it. There’s still so much to see and do. I’m a sucker for quests. What is your favorite gaming memory? Beating Spyro for the second time as an adult. I can’t explain the pride I felt at getting 100% completion on my favorite childhood game. What is your favorite gaming series? Kingdom Hearts, hands down. I fell in love with the first and second games then I met my husband who showed me deeper into the fandom. What is your favorite part about gaming? I’m really into “being the best” so the best part of gaming to me is completing quests and leveling up to be stronger. What is your favorite genre of music? I like a little bit of everything. Dark Pop and Alternative Rock are my favorites though. What is your favorite book or book series? So many…. Harry Potter, House of Night, and more. What things do you do to relax? I throw on a show I’m currently watching (Like StarGate SGl), get in some comfy clothes, and just chill. On the other side of the spectrum, I go for a run while listening to podcasts like Tales or Getting Curious with Jonathan Van Ness. What inspired you to start blogging? I started blogging as a creative outlet. I realized I really enjoyed writing about geeky stuff like gaming and cosplay then A Geeky Gal was born! What is one of your favorite articles that you have written? My 30 Day Video Game Challenge is still one of my favorites but a more recent favorite is my post about PTSD. What is your favorite part about blogging? Interacting with my readers and other bloggers. I find it easy to connect with others through my writing and it makes me feel a little special when someone comments about how they feel similar or when they can tell me why they feel the opposite. It’s great to learn others’ perspectives. I’ve been playing Skyrim slowly for the first time and it’s so much fun and there’s so much to do in the game! My best friend told me about Kingdom Hearts and that’s why I got Kingdom Hearts 1.5 + 2.5 ReMIX. I also love Harry Potter, my mom used to read me the books when I was really little until I learned how to read them on my own! Thank you! Are you excited for KH3?! I am, I can’t wait to play it! I love the Kingdom Hearts series. I loved it when I was a kid and I love it even more now. January 29th has got to hurry up. Now that I have a PS4, I’m really excited to play Kingdom Hearts! Yes! I can’t wait to see what you think! I thank you for the shout. “Never stop writing” is a technique that’s worked for me; I try to shoot for 1,000 words written of my latest review per day. No problem! I personally struggle with writing and choosing to comment to just write something every day keeps me from getting writer’s block so much. I can totally relate to how you feel. It took therapy to make me feel validated in my feelings. I was constantly shoving my feelings aside as invalid because I was always told I was being dramatic and sensitive. I recommend therapy to everyone. 100%. We gotta continue to get rid of this stigma around mental health. Skyrim!!!! We’ve been playing Skyrim for months and we can’t get enough of it. Mostly just fooling around in the game LOL Also: Harry Potter 😀 Yay! Right?! I will play Skyrim until I’m 90.